One of the ways in which the mighty Soviet Union maintained control was through extensive propaganda aimed at young children. Education was the cornerstone of Stalin’s efforts to create a new society. And the media that students were exposed to in the classroom promoted the communist system, obedience to the state, and the rejection of Western ways of life. 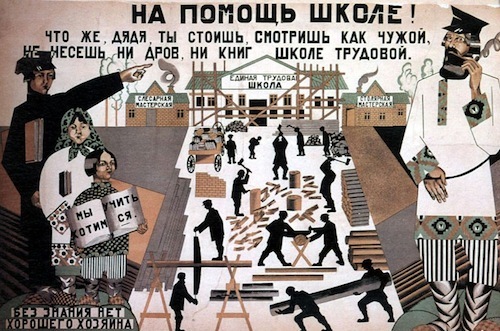 These efforts were undoubtedly a form of social control, and at the same time they depicted the utopia that the Soviet Union intended to create. The propaganda was designed to strengthen values like co-operation and respect for authority figures and to encourage the generation of workers being raised under communism to better themselves. 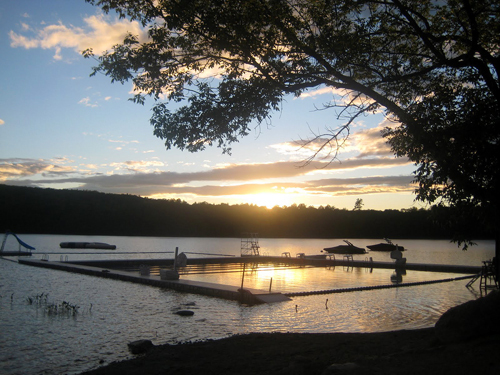 There was also a strong emphasis on technological and scientific advancement that is interesting to note. 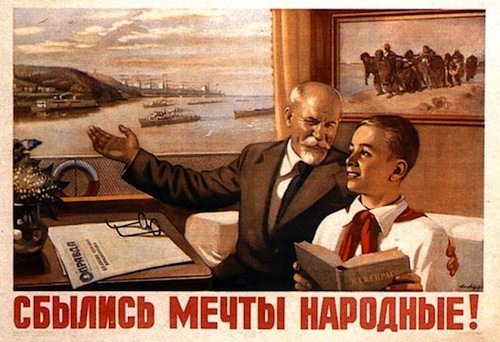 Here, then, are 10 fascinating Soviet education propaganda posters. The “cult of personality” surrounding Stalin was part of the dictator’s plan to increase his hold on the Soviet Union. The history of the Communist Party was rewritten to make the Soviet leader appear central to everything that had taken place after the 1917 revolution. And propaganda depicted him as a god-like and benevolent figure. 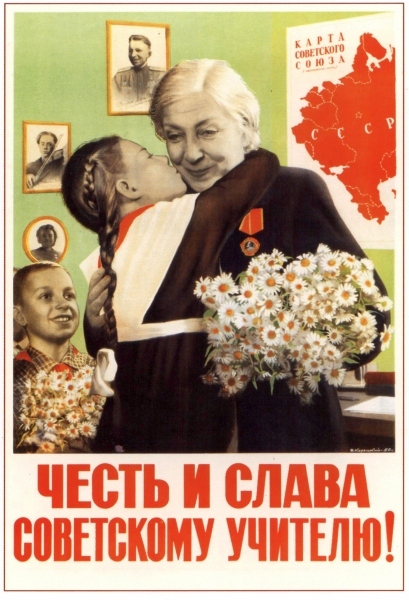 This poster used the Soviet premier’s reputation to encourage school children to excel in their classes. It depicts a decorated pupil being praised by Stalin, who calls him “my student.” Since Stalin was portrayed as a role model for Soviet citizens, this was clearly meant to encourage children to do well at school. Interestingly, the dictator’s cult of personality was so successful that Soviet citizens who met him in person were frequently mesmerized with awe. Stalin also showed himself to be a formidable negotiator when convincing ideological opponents like Britain and America to work with him during WWII. This poster is interesting because, despite the fact that it was created around 1980, its color and style almost seem closer to that of older Russian popular artwork, or like the traditional, brightly painted Russian nesting dolls. 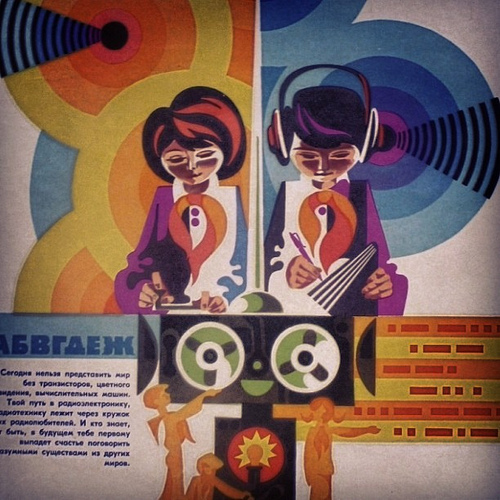 The whimsical style also contrasts with the theme of the poster, which depicts the Soviet school as a futuristic place where students have access to high technology, such as classes taught with headphones and recordings. Many Soviet propaganda pieces worshiped the future, with themes of a “new society” that would be created using technology and industrialization. This poster was first printed in 1951. During this time period, Soviet citizens were provided with free education, but the cost was a highly nationalistic curriculum designed to inspire devotion to the state. It is significant that the teacher and central student in the picture are both women. Under the Soviet Union, gender equality was supposed to be practiced, and women were provided with an equal education. Moreover, during the 1940s and ‘50s, campaigns aimed at persuading women to take professional jobs in medicine were clearly having a big impact. By 1950, 75% of all Soviet doctors were female. The propaganda aim of this poster seems to have been to persuade students to respect their teachers and regard them as trustworthy figures. This would, in turn, make them more likely to absorb the doctrine that was taught in classrooms. 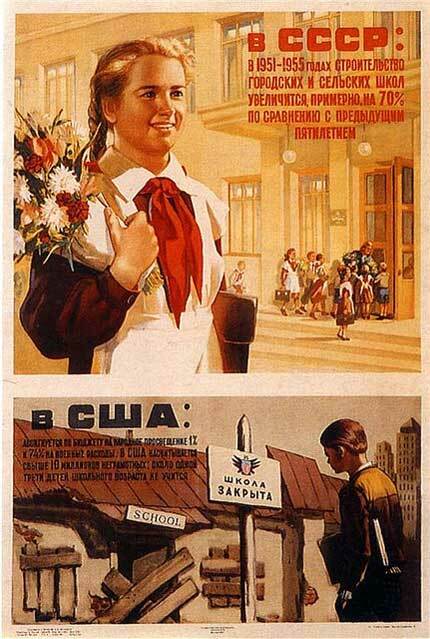 By 1959, attempts to culturally control Soviet schools were well underway. The subject matter of lessons was rigidly controlled and made to subscribe to Marxist-Leninist orthodoxies. It is likely that attempts to encourage students to become involved with “cultural” subjects like drawing and music were intended to solidify the Soviet political ideology in children, for the arts themselves served the purpose of propaganda. 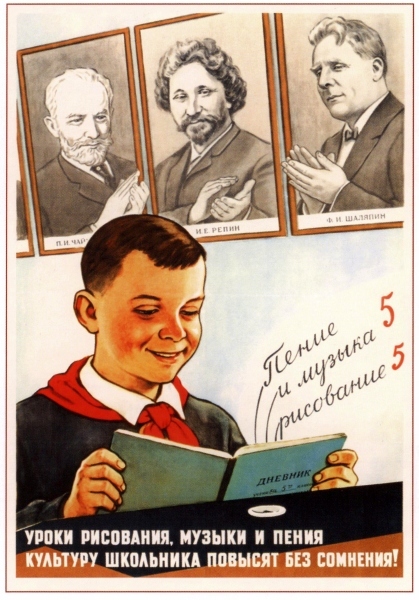 In this poster, the figures of composer Pyotr Ilyich Tchaikovsky, painter and sculptor Ilya Yefimovich Repin and opera singer Feodor Ivanovich Chaliapin behind the student’s head are applauding his efforts in the classroom. School uniforms are designed to enforce uniformity and equality amongst those who wear them. Many schools discontinued the practice of uniforms being worn after the collapse of the Soviet Union, as they were seen as unpleasant reminders of the restricted society of the old era. 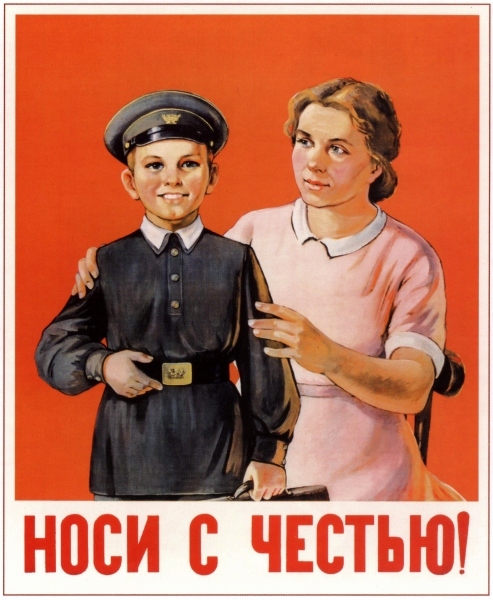 The young boy’s outfit in the picture looks similar to a military uniform, which suggests that the purpose of the poster was to encourage students to see themselves as potential soldiers for the Soviet Union. Meanwhile, the slogan, “wear it with pride!” implies that students had a duty to the state to become educated. By encouraging students to take pride in their schooling and do well academically, the state, presumably, meant to benefit by increasing the pool of educated people at its disposal. The moods of the two different sections of the picture show a complete contrast between the brightly lit, confident Soviet pupil and the slumped, dimly lit American. This conforms to the standard portrayal (in such pieces) of Soviet citizens as happy and optimistic about the future and the West as decadent and unable to provide for its citizens. For obvious reasons, the Soviets produced large amounts of anti-US propaganda during the Cold War. This example complies with the common theme of Soviet propaganda, which tended to show its citizens as superior to their Western counterparts. This piece seems to have been intended to inspire students and citizens to rebuild Russia’s educational system. During WWI, illiteracy grew significantly and many children were unable to attend school. In 1919, a new system of universal education was established, and a curriculum was adopted in 1923. It therefore makes sense that the Soviet government would have wanted to encourage adults to take part in rebuilding their radical new system. In the poster, metal and wood shops are depicted on either side of the school. This may well have been tied to the Soviet veneration of productive manual workers – and a reminder that industry was just as important as education. The poster’s drawing techniques are stylized and reflect the designs of popular Russian folk art, which could be because it was created at the beginning of the Soviet Union’s history, before the socialist realist art style had become established as state policy. 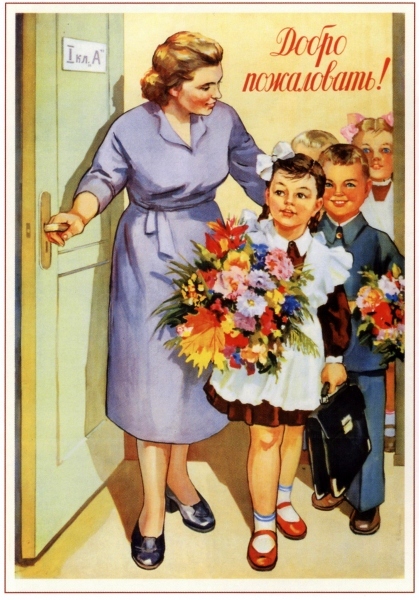 This post-WWII poster encouraged Soviet students to excel at school. It was created in 1948, a time when the Soviet educational system was still relatively inflexible and pupils were commonly held back a year in school. It would therefore have been especially important for children to make great efforts with their studies. During this time period, the Soviet Union was embroiled in the Cold War and was still straining to recover from the economic devastation brought about by WWII. Repression in schools was also taking place, and Western methods of science and education were discredited, including entire fields like genetics. Yet the Soviets recognized that education, particularly in subjects like engineering, was hugely important to their country’s national prestige. And it is likely that propaganda pieces like this one were aimed at improving their country’s situation by increasing the number of well-educated workers available. 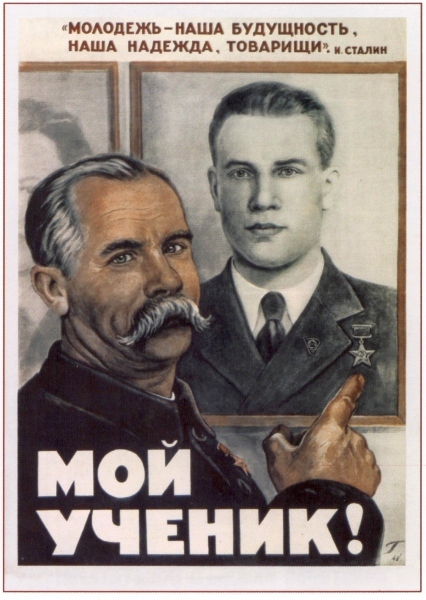 This poster also uses the “glory to the Soviet teacher” slogan, much like the one seen in entry 8. 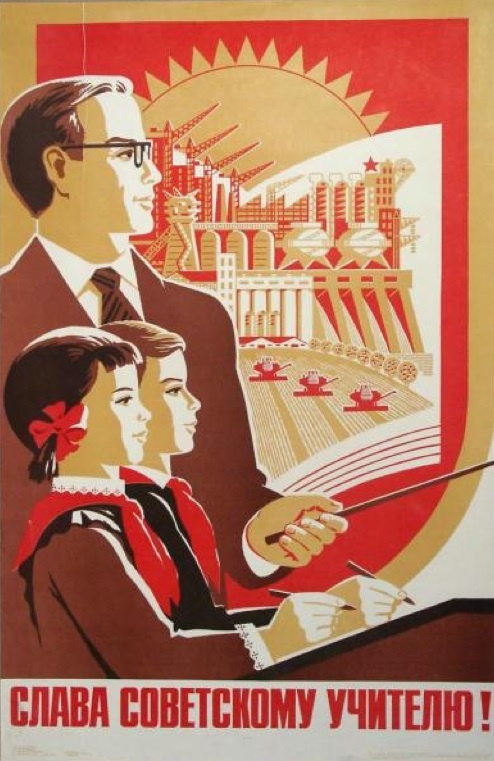 The picture depicts the teacher and pupils as virtual cogs in the Soviet state machine, with the children’s studying, by extension, obviously intended to reflect the same idea. Interestingly, an American study in the 1950s found that Soviet teachers were well educated and tended to have small class sizes, which made them effective educators. The same study revealed that the Soviet system placed far more emphasis on science and engineering than its American counterpart. Vladimir Lenin was the first leader of the Soviet Communist Party, the architect of the revolution, and the first head of state of the Soviet Socialist Republics. This early Bolshevist hero was one of the most revered people in the Soviet Union. Stalin gained much of his legitimacy as a dictator from claiming to have been Lenin’s heir and in his confidence. It is therefore unsurprising that Lenin’s “cult of personality” endured following his death. The head of state’s body was mummified and placed on display in the Red Square, the city of Petrograd was renamed Leningrad in his honor, and his likeness frequently appeared in statues and paintings. As with Stalin, Lenin was held up as an exemplar of everything communism and the revolution stood for. 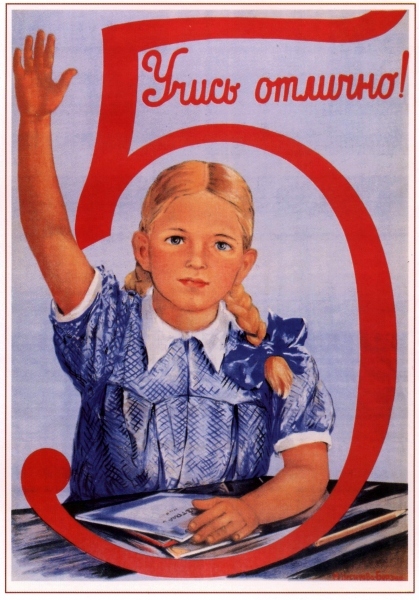 Posters like this one held two purposes: to help instil the cult of personality in the minds of schoolchildren, and to encourage values which the state wished their students to hold – like obedience to the government and hard work at school.